Our team’s design for this new public safety campus creates a distinct identity for the police headquarters and fire department while establishing a civic anchor in a developing neighborhood of the city. Sited alongside a busy city corridor in the city’s Mission Bay district, the building was designed to blend into the developing neighborhood while establishing a distinct presence befitting a civic landmark. The highly resilient structure houses critical municipal services, including the city’s police headquarters, a district police station and a fire station, under one roof. An adjacent 1920s masonry fire station is rehabilitated for community use. The master plan unifies the new building, composed of two six-story wings, and the two-story fire station into a striking civic complex. A gracious entry plaza and south plaza connect with generously landscaped sidewalks, reinforcing the historic fire station’s unique identity and important role on the site. Through a public art program sponsored by the San Francisco Arts Commission, the plaza features custom artwork that completes the civic composition. By engaging the building with the site, the design aligns the needs of users with efficient environmental performance. A concrete plinth establishes a secure base for the structures, which are enclosed in a variegated, high-performance glass curtain wall that symbolizes transparency in government. Two 63-foot-long office wings connect via a transparent east-west oriented core to form an offset H-configuration that tempers the facility’s perceived massing from the street. This layout provides daylight, views and natural ventilation for building occupants. A delicate louvered metal scrim, floating apart from the structure, wraps the towers from north to south and minimizes unwanted glare and heat gain. Other sustainable elements include green roofs, rainwater harvesting for irrigation and plumbing, low-flow plumbing fixtures, solar hot water heating, an active chilled-beam cooling system and healthy building materials. HOK designed the project, which achieved LEED Gold certification, in collaboration with Mark Cavagnero Associates. 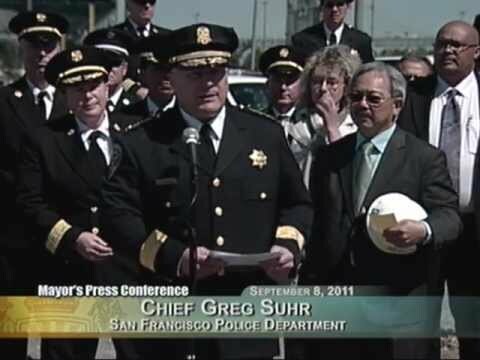 See Mayor Edwin M. Lee break ground on the new San Francisco Public Safety Building.